An old trope that can be either physical or metaphorical in its appearance within a story. In Tarot reading, The Tower is considered a sign of ill omen or adversity, but can also stand for civilization, higher learning, or lone, defensive strength when regarding a specific character. Usually, The Tower is a structure of solitude or homage to a character whose vision is farseeing and above those "bound to earth". It can also be a prison to where a main character is left to die, or a representation of a villain's Pride, as (s)he rises higher towards heaven while surrounded by their empire. See the Biblical story of the Tower of Babel. This has a certain historical basis: medieval castles were typically built around a central tower, called the keep or donjon, which couldn't really be targeted by siege weapons and would continue to resist after the rest of the castle fell. The donjon was the most secure part of the castle, and so the lord and lady lived there, treasure was stored there, and prisoners (typically held for ransom) were kept there — thus the modern English meaning of "dungeon." A character that represents the Tower is another story, they can be a tall figure, or even a dwarf with a great amount of presence. They usually have great fortitude both mental and/or physical, sometimes coming off as stubborn or gruff. They're also portrayed many a time as loners unless with others who share a similarity with him, or need him for a time. The phrase "ivory tower" ties together the connotations of isolation and pride into a concept that intellectualism or academic research make you lose touch with "real life". In many fantasy settings, towers are usually the homes, laboratories and/or schools of magic users. This probably goes back to the Middle Ages, when astronomers lived in towers to more conveniently observe the stars, and when not all astronomers were magicians but virtually all magicians were astronomers; a famous, possibly Trope Codifier example in modern fiction is Saruman's tower Orthanc, the keep of Isengard. Most works of fiction ignore the stairs issues when working in settings prior to the invention of elevators, but in real life, high towers would be not be the prime location to live or work unless you never descended. For cases when man's Pride sends him too far in the other direction, see Dug Too Deep. 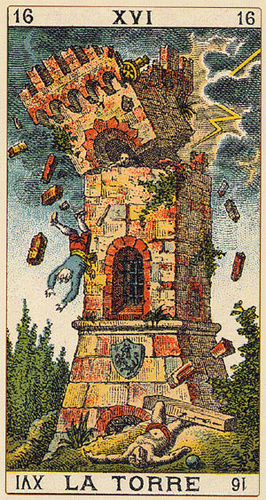 The Tower is Card XVI in the tarot deck, although mostly symbolic. In the Rider-Waite deck, it's a tower being shattered by lightning. Generally speaking, it represents either a truth unearthing something not pleasant, a tale of pride not unlike the Tower of Babel, or both. Related tropes to the tarot card are Heroic BSoD, Break the Haughty, and Go Mad from the Revelation. The Black Tower: Tall, dark, and evil. home of the Corrupt Corporate Executive or Mega-Corp in a contemporary or futuristic setting. Don't be surprised if an Executive Suite Fight happens in one. Star Scraper: any structure whose height is beyond imagining and/or sane building limits. The Ominous Megastructure: like the Tower of Babel, A gigantic, unimaginably huge "looms-over-everything" structure. The Mage Tower: usually contains telescopes, orreries, hidden artifacts, secret passages, tomes of eldritch lore, and dangerous devices Powered by a Forsaken Child in a terribly-cramped footprint. The Haunted Castle: ominous, foreboding and perched on a cliffside, accompanied by lightning and haunted by ghosts and monsters or mad scientists and their assistants. The Ominous Floating Castle: some more ominous than others, but always important. Lighthouse Point: exactly what it says on the tin. Clock Tower: often the scene of a Cathedral Climax. World Tree: the Living, Genius Loci version. The Mobile Maze or Dungeon is the inverse trope: a more expansive version of the Ominous Castle or Megastructure, with more stuff below than above. See also Big Labyrinthine Building, which may or may not be a Babel-like megastructure. Compare with Building of Adventure. The Lighthouse might come into this. Star Scraper: an impossibly tall tower. Tower of Babel: the literal type. FLCL: Medica Mechanica is a gigantic building shaped like a steam iron that looms over Naota's hometown and occasionally vents huge clouds of steam. The Tower of Retribution from Berserk. JoJo's Bizarre Adventure has the stand Super Fly, which is an electrical transmission tower. The Lunatic Eclipse Building in Tokyo Ghoul :Re. Not only does Matsuri refer to it as Daedalus's Tower, but it proves to be the site of a Bloodier and Gorier arc where Anyone Can Die. It concludes with Shuu Tsukiyama being thrown from the roof and Kanae leaping off to save him, dying in the process. The tower that connects the levels of the afterlife from Spawn. Two intensely significant towers in The Keys Stand Alone: the White Tower, where the good Pyar gods are imprisoned. It will collapse in a year if the other tower, the Black Tower, isn't breached and its inhabitants defeated. Also the seven wizards' towers of the ruling wizards of Daarthayu. Shrek: In accordance to fairy tale tradition, Princess Fiona is imprisoned in the "highest room of the tallest tower." The "New Tower of Babel" in the silent movie Metropolis. The "wizards live in towers" idea is used in A Connecticut Yankee In King Arthurs Court. I, Robot: The headquarters of US Robotics is the tallest building by far in Chicago. Guess where the Evil AI is situated? If you said "the basement", shame on you. The Evil Skyscraper from Freejack is not just the tallest building in Manhattan (strike one) and the office of Anthony Hopkins' character (strike two); it contains the souls of paying customers who are artificially implanted into the eponymous freejack's bodies. In Rapunzel, the eponymous heroine is depicted to be trapped in a tower till the prince comes to rescue her from imprisonment. "Sleeping Beauty" is sometimes told with the spinning wheel that dooms her to eternal sleep being at the top of the tallest tower of the castle she inhabits. "Childe Rowland to the Dark Tower came..." is a line from an old ballad quoted in King Lear, retold in the English fairy tale "Childe Rowland", and used as the basis of a famous poem by Robert Browning. The Lord of the Rings has a striking number of significant towers — most importantly Sauron's fortress Barad-dûr (meaning "Dark Tower"), Saruman's Orthanc, and the fortresses of Minas Tirith and Minas Morgul, both of which are centered around a tower. Volume two even has the title The Two Towers. Stephen King's The Dark Tower is based entirely around this motif. One of King's other books, The Eye of the Dragon, has Peter imprisoned in a cell at the top of a tower for most of the second half of the book. Frankenstein, Dracula, and countless others. Ulysses: The first episode of the novel is set in the Martello tower at Sandycove. Throughout Harry Potter and the Half-Blood Prince Professor Trelawney can be seen going around mumbling about predictions, which no one heeds- particularly about how she keeps dealing the card of 'The Lightning Struck-Tower' foretelling great danger and upheaval. Then comes the chapter by the same name, which takes place in the actual astronomy tower, the highest part of Hogwarts. It's there that Snape kills Dumbledore, fulfilling the prophecy both literally and metaphorically. A Song of Ice and Fire has Harrenhal — and its very ostentatious five towers of ominousness. Yup, It made up for not having the tallest of the tall by going for bulk. Built by the Ironborn under Harren the Black as an impenetrable, siege-proof fortress with which he could subjugate the Riverlands and (attempt to) impress the Iron Isles. But... just as it was fully completed, Aegon Targeryen arrived in Westeros with his dragons, and burned it to the ruin it is now from the air. With Harren and his family still in it. Harrenhal has passed down along many Houses since, almost all of whom have been driven to ruin, much as its builder, House Hoare, was. It's so huge and damaged, it cannot be defended, maintained or repaired easily on a regional lord's income, and that's without suddenly coming into an important title going to people's heads in very predictable ways. Also, the castle is apparently cursed, with everyone who holds Harrenhal undergoing tragedy, often unrelated to running the place. An even better example is the impressive lighthouse that is the Hightower of Oldtown, from which the ruling family derives the name and motto of their house. It's the tallest structure in all of Westeros, currently surpassing even the Wall in the North in height. Note "currently" — the Hightower has fallen several times, only to be rebuilt stronger, brighter and better each time. Also, although they don't live in the Hightower itself, the wizard-like Maesters are based in the nearby Citadel, so the sigil of the Hightower is associated with them as the emblem of Oldtown. In addition, before the Faith of the Seven relocated their administrative HQ to the Great Sept in King's Landing, it was under the shadow of the Hightower — and, arguably, Oldtown still is their spiritual home base. They all light the way, each in their own ways. Revolution: Played straight, and name-checked. We honestly don't know what it actually is called; it has been and may actually be called The Tower. The Tower is first shown in "Ties That Bind", mentioned by name in "The Stand", and shown in "The Love Boat", "Clue", "Children of Men", and "The Dark Tower". The first season of The Odyssey is a quest to reach the Tower. The entire point, setting and Series Goal of Tower of God. The Tower is a semi-sentient, self-contained Place of Power built god knows when, housing billions of people and creatures on 134 conquered and even more wild floors, each the size of North America and several kilometers high* making it most likely Bigger on the Inside. It has been said that everything and anything people have ever wished for can be found at the top of the Tower. Therefore, many people wish to climb it, giving up everything they have to obtain their one desire or having only their desires and dreams left. The lucky ones that get chosen to climb, the Regulars, must pass cruel, hard and strongly varying tests, which used to be held by the Guardians, but ever since King Zahard conquered the greatest part of the Tower, the inhabitants of the place took the Guardians' place. The Tower is a fantastical realm, as it contains a force known as Shinsoo, which can be breathed instead of air and enables those who know how wield it properly to do the impossible. Vocaloid: Hatsune Miku's song, Tower of Sunz, features a tower that might or might not be symbolic. The first song off the first album by 1970s glam-rock band Angel: a medieval fantasy epic titled "Tower." The Bible: The Tower of Babel is probably one of the more infamous examples of the trope. BattleTech has the Mercer Building, built by Clan Steel Viper, and is the tallest structure in Clan Space, standing about 1000 meters. It fell along with Steel Vipers when they were annihilated in the Wars of Reaving. Hausser, the capital of the imperial principalitynote Actually a country governed by wise people of Ilmora, in Anima: Beyond Fantasy is described to be a city full of towers, some of them so high -up to hundreds of meters, and because of the aristocrats who live there competing to see who builds the highest one- that are in the danger of collapsing if they continue to be heightened. Overlap with Mage Tower, since some of them are said to hold forbidden stuff. The Master Builder. The main character loses his life when falling from a high tower structure. Which he initially feared to climb. The Combine Citadel from HalfLife 2 certainly qualifies. The Tattered Spire in Fable II. The tower from Super Mario RPG was pretty evil... or is that more of a castle? In Shin Megami Tensei Persona 3, the tower is not only represented by a monk character who smokes and drinks at a local night club, but is also present in the form of Dark Hour version of the School. The Tower Social Link in Persona 4 is represented by Shu Nakujima, a Child Prodigy whose proud mother pushes him to overachieve even further, leading to his becoming socially isolated and discontent. The Tower Social Link in Persona 5 is represented by Shinya Oda, a middle school boy whose skill in arcade games leads him to be extremely competitive, causing problems with his classmates. The Tower Of Babil from Final Fantasy IV cumulates evilness with impossible height: It starts in the underworld (which itself has enough height for airships to fly in) and even above ground, is still several times higher than mountains! The Tower of Zot, however, while it has the evilness, lacks the prestige because its exterior is never seen, anywhere. The Tower of Babel in Doom is the name of the level where the Cyberdemon, perhaps the most famous monster from the most popular video game of all time, is first encountered. It is the final level in episode 2. The level title is apt, as the Cyberdemon itself is the ultimate tower of strength in the game, unmatched in brute force (except perhaps by the Spider Mastermind), resistance to injury, not to mention sheer physical height. The last dungeon of MOTHER 3 which is, intended or not, somewhat relevant to the Tarot Motif. Ganondorf's tower from The Legend of Zelda: Ocarina of Time and The Legend of Zelda: The Wind Waker, game that also has the Tower Of The Gods; Eagle's Tower in The Legend of Zelda: Link's Awakening and the Stone Tower in The Legend of Zelda: Majora's Mask; and Agathnim's and Ganon's towers in The Legend of Zelda: A Link to the Past. Final Fantasy VIII's Lunatic Pandora. The entire plot of Makai Toshi SaGa revolves around one, with the doors on each floor leading to entirely new worlds. In Hellsinker from stage 4 and onward the main characters spend the remaining of the stages to climb up the huge Cardinal Shaft. How could we forget Devil May Cry 3, where the majority of the game takes place in a massive demonic tower that just bursts out the ground? In addition, the challenge levels take place in an ever ascending version of the same tower. The Tower of Babel from Xenogears, several kilometers high. It's actually part of the hull of the starship Eldridge which somehow managed to land perfectly vertically and remained stable after it broke up in orbit. Wild ARMs 1 has Ka Dingel, a tower with a transporter on it's top that sends people to an orbital colony, technically making it a space elevator. Dormin's tower in Shadow of the Colossus is by far the largest structure in the Forbidden Land, and can be seen even from distant corners of the land. Right from the start of the game, it is shown to be a place of magic that has the potential to bring people Back from the Dead, and it soon becomes apparent that understanding the tower is the key to understanding the plot of the game. In Dragon Age: Origins, Ferelden has two of these. The Mage Tower, Kinloch Hold, is a relatively healthy example of the Circle of Magi. The other tower, Fort Drakon, is the equivalent of the Tower of London and was built by the Tevinter Imperium during its reign. A city formed around it after the Tevinters' defeat, and it's now used to house prisoners. There's one at the end of Fire Emblem Radiant Dawn that the heroes have to fight their way to the top of. Antichamber: The primary endpoint for successful puzzle completion, and a good indicator of progress. As would be expected, the act of navigating this tower doesn't necessarily involve going up and down, and it's easy to find the various levels of it out-of-order. You start the main game in the middle of level 1. On the other hand, once you have the Yellow gun, enter the tower at level 1 and grab the light blue cube, and it will teleport you to a seemingly random place. However, complete the puzzle where you get dropped off, and you find level 2 of the tower, and so on until you reach the top. The big tower (or towers?) of Rod Land, where your mom has been kidnapped. Seen in any of the Dark Parables which feature a Girl in the Tower, including Curse of Briar Rose and Ballad of Rapunzel. The Altmer (High Elves) would construct the Crystal Tower ("Crystal-Like-Law") in the Summerset Isles in direct emulation of the Adamantine Tower. Little is known of the "Stone" of the Crystal Tower, but it is said that it was once a person. During the Oblivion Crisis, the forces of the Daedra managed to destroy the Crystal Tower. At least, in Mundus (the mortal plane). Per the Altmer, the Crystal Tower continues to exist in planes other than Mundus. Speaking of the Dwemer (Deep Elves or Dwarves), they attempted to use the Heart of Lorkhan to construct their own Tower, as well as to become a new god - Anumidium (or "Walk-Brass"), a Humongous Mecha of Reality Warping proportions. They intended to use it to Ascend to a Higher Plane of Existence, but something went awry. Interrupted by an attack from the Chimer (who considered this act blasphemous), Kagrenac, the Dwemer High Craftsman, attempted to tap into the Heart but instead caused the entire Dwemer race to disappear from all known planes of existence in a single instant. The Tribunal would then claim the machine, now know as Numidium, and would later trade it to the Emperor Tiber Septim in exchange for special privileges when Morrowind joined Septim's Empire as a Voluntary Vassal. Septim would use it to complete his conquest of all of Tamriel, famously using it to capture the Altmeri captial city of Alinor in less than an hour of fighting. However, as a result of the events of Daggerfall, the Numidium would be destroyed along with its makeshift Stone, the Mantella (an immensely powerful soul gem said to contain the soul of a Shezarrine). The Ayleids (Wild Elves) of Cyrodiil would construct the White-Gold Tower on an island in the heart of their country, using the "Chim-el-Adabal" (said to have been created from the crystallized blood of Lorkhan, collected as it traveled across Tamriel to its resting place in Morrowind) as their "Stone." Following the Alessian Revolt (a revolt of their human slaves), the tower would be taken by the Nedes (ancestors to most of the modern races of Men in Tamriel). After capturing the Tower, Alessia, leader of the Nedes, would forge a pact with Akatosh, the Top God of the Aedra and Dragon God of Time. Akatosh gave to Alessia and her descendants the Amulet of Kings (whose centerpiece was the Chim-el Adabal), as well as the Dragonfires of the Imperial City. So long as the Empire maintained its worship of Akatosh and his kin, and so long as Alessia's heirs bore the Amulet of Kings, Akatosh and his divine kin would maintain a strong barrier protecting Mundus. This, of course, came to an end during the Oblivion Crisis when Martin Septim, last in Alessia's metaphysical line, shattered the Amulet of Kings and sacrificed himself to end the Crisis. Like Red Tower before it, White-Gold was left without its stone. The Bosmer (Wood Elves) grew a tower rather than construct one, known as the Green-Sap, grown from the Perchance Acorn (their Stone). According to the Bosmer, every story of the Green-Sap is true, with none "truer" than any other. The Green-Sap had the ability to "walk" throughout their forest homeland of Valenwood. However, the mage Anumaril used a "fangled" magic staff created in emulation of each Tower to turn the Perchance Acorn into a Definite Acorn, giving the Green-Sap a "true ending" and freezing it in place, never to "walk" again. So, while the ending to the story of Green-Sap is determined, that ending still remains a mystery. The Green-Sap still stands in Valenwood's Elden Grove. "Snow Throat" (aka the Throat of the World) is the Tower of Skyrim, and is also the tallest mountain in all of Tamriel. It's stone is said to be "a cave," but beyond that, little is known. It originally attracted the Falmer (Snow Elves) to Skyrim but it would fall into the hands of the Nords after their ancestors (the Atmorans) nearly drove the Falmer to extinction. Despite already being the tallest mountain on Tamriel, Snow Throat's apex is said to only be "half there." Atop the mountain sits High Hrothgar, the monastery home of the Greybeards, who study the Thu'um, the Language of Magic of the dragons. It is also home to the "Time Wound," created when ancient Nord heroes used the power of an Elder Scroll to banish Alduin in an age long past. The eighth Tower, Orichalc, also has the least known about it. It is believed to have been in Yokuda, the ancient homeland of the ancestors to the Redguards to the west of Tamriel. There, the ancient Yokudans fought a devastating war against the Sinestral Mer (Left-Handed Elves), who were driven to extinction. With Yokuda believed to have been sank beneath the sea, the Orichalc tower is believed to have sank with it. There is also the Ceporah Tower on the island of Artaeum, home of Psijic Order, a powerful Magical Society and the oldest monastic order on Tamriel. The Ceporah Tower is older than any of the other metaphysical towers save for the Adamant Tower itself, said to have been built by an unknown civilization predating the Aldmeri arrival in the Summerset Isles. The ancient and magically powerful Tower is used by the Psijics in certain rites and rituals. It is under the Ceporah Tower where Galerion confronted Mannimarco about his practice of The Dark Arts, leading to the founding of both the Mages Guild and the Order of the Black Worm. Rime has a large tower as the focus of all play areas, and the boy's quest through the first four sections of the game is to unlock its floors and ascend it. The fifth and final section shows that the boy was actually Dead All Along. It reveals that the tower is nothing mystical, but simply a lighthouse visible from the boy's bedroom, and the father turned it into a symbol in the story he told himself to deal with his grief.